Within this strand, we are going to explore the concept of a national sound or national ideals in music.� We often hear about concepts such as the Nordic Tone or the Dutch sound�but want to examine where these concepts come from.� In other words, do they exist as inherent qualities or are they bound up with some kind of national mythology? What role do notions (self-images, stereotypes) of national identity play in the conceptualization and international spread of jazz culture? How do such notions relate to other forms of cultural identification? 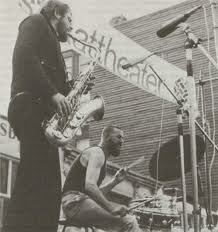 Willem Breuker and Han Bennink playing outside. On the banner it says: ‘straat theater’ (street theater). From the mid-1960s on, a group of jazz musicians in the Netherlands (Misha Mengelberg, Willem Breuker, Han Bennink, Theo Loevendie, Willem van Manen) started to willingly separate their music from American models, partly out of rejection of American politics. They felt that jazz, or improvised music as they came to call it, called for a more local identity and they set out to incorporate Dutch and other European musical idioms into their music.� They merged their music with other techniques as well, such as theatre and visual arts.� Mostly in Amsterdam, a local Dutch version of improvised music emerged, rooted in ideas of what it meant to be Dutch.� Interestingly, non-Dutch musicians were drawn to the Amsterdam scene too, and contributed their versions of perceived Dutch-ness, in which theatre, absurdism, anti-establishment, and social and (leftish) political activism were some of the keywords. �Furthermore, musicians and composers with more contemporary music backgrounds became involved, further stretching the boundaries of jazz and improvised music.� The contribution of musicians from abroad (e.g. from Germany, South Africa, United States, United Kingdom) to Dutch jazz is but one of the many paradoxes that characterize Dutch improvised music. �While they propagated a strong anti-establishment ideology, the improvising musicians managed to successfully organize government support, through a renowned system of state subsidies. �Furthermore, improvising musicians positioned themselves as free, independent artists, yet they formed all kinds of organizational bodies (i.e. The Interest Group of Improvising Musicians, or BIM), and through those, founded concert stages such as the BIM-huis, a hall with a world-wide reputation and large scale budget. �In addition, since many musicians from the Amsterdam hinterland were drawn in, much of their bohemian non-conformism seemed rooted in middle-class concepts of what it meant to be an artist.� Next to these improvising musicians, a group of more traditionalist jazz musicians was working and these people prided themselves in their professional financial autonomy. �They continued to draw inspiration from the American jazz tradition, and supported themselves by playing studio work for radio and television; where the �impros� saw themselves as process-oriented artists, these �jazzos� were more result-oriented professionals.� Inevitably the two groups crossed paths often, and a complex dialectic ensued, in which all these notions, self-images, identities and stereotypes were involved.� For example, if organising government subsidies was one of the main achievements of the Dutch jazz avant-garde, then taking jazz to the conservatory was the accomplishment of the traditionalists. This strand will investigate the issues of nation, cultural identification and inheritance, examining the role that notions of national identity play in the conceptualization and international spread of jazz culture.� The�study of Dutch jazz� will form�a central part of this investigation. 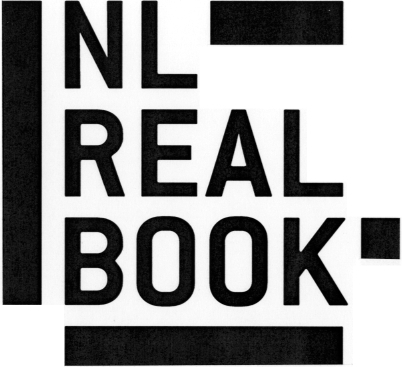 The official launch of the first 50 titles will be at the North Sea Jazz Festival.